I was about to call them gentlemen, but that would be quite odd, wouldn't it? guys are all about by now. The band comprises the same 4 familiar faces since 2003 and is one of few bands out there that is able to keep its lineup intact for so long and that's probably why they are able to stick to their guns through hell or high water, but maybe also the reason to why no major changes are made musically and to the whole appearance of the band. 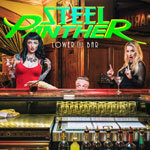 The foundation stays solid in glam metal/rock of the 80's and even if the actual music isn't a carbon copy of their past achievements and a few elements and approaches are new to Steel Panther, it's yet following the band's specific vein for the most part. It's simply put just 10 new songs (plus one cover song) where they occasionally and perhaps even accidentally borrow things from their previous records and where they, unintentionally I hope, in some parts of certain songs also come very close to stuff made by Warrant and Mötley Crüe for instance. If you possess some kind of humor at all and stand to listen to simple platitudes as well as you don't take things all too seriously, it's hard to not laugh or at least smile a little bit to those dirty and provoking lyrics that have always been a characteristic and essential key to the band's performance. It's also quite impressive, I think, that they have the energy to put out lyrics within pretty much the same topic on each and every album so far. In terms of quality, the songs are jumping from peaks to valleys all over the record. We get some really good songs where the musical side is quite attractive and the lyrical part is amusing, but there's also a bunch of tracks that pass by kind of unnoticed and hence Lower The Bar doesn't have the capacity overall to level up with its predecessor All You Can Eat. It's nevertheless a fairly good album and the band will probably still hold its market share concert-wise and have a decent amount of people coming down to the shows for a few more years before this indecent ensemble eventually call it a day.